This past weekend has been charged with emotion. I was given the very great privilege of speaking at a grief conference about Xavier. As someone who has always enjoyed public speaking, I relish those opportunities. They mean I can talk about my son with people who truly want to listen. They mean that Xavier’s name is known by more people. They give me an opportunity to mother my son in a very public way. Not only did I speak about Xavier, his death and the wake of it, but my mother and a dear friend spoke. I knew that their words would affect me much more than speaking my own truth. And they did. The cumulative effect of three different perspectives on one loss was very powerful and there certainly wasn’t a dry eye in the room. Yet, I still found it cathartic. The tears that flowed were healing ones and the gifts that both my friend and mother gave me through their words and their grief, profound. Those in attendance thanked me for my words and called me “brave” and “amazing”. I didn’t really feel I was either of those things – but rather just mothering my baby in the best way I know how. The following day at the same conference I was part of a panel talking about first responses and responders to child death. There were paramedics, policemen, counsellors and myself, representing parents. I didn’t really prepare myself for this panel – I thought I would be fine. Talking about Xavier brings me more joy than tears, even when talking about the hard stuff. So I was surprised to find myself feeling flat and confused when that session ended. The paramedics were beautiful souls, world weary and the kinds of eyes you could immediately tell had seen too much. Even when they used their clinical terms, that medical mask, you could sense a sadness. The police officers were kind and spoke measured words. They talked about the heart breaking balance between being an advocate for the child, assisting the parents, assisting the coroner and doing it all within limited resources. They too had a certain heaviness about them. I had painted them in my mind as professionals that donned hardened hearts to protect them against the realities of their jobs, but the horror of child loss is sharp enough to pierce even that armour. They were human and raw and real. And I wasn’t quite prepared for that. I was able to ask the paramedics are few questions. I have always wondered about those that were able to help us. Whether they went home knowing what Xavier’s fate would be. Or whether they clung to the chance of a miracle. Whether they shook off that early morning or whether it stayed with them. The paramedics at the conference explained that they rarely find out what happens after they attend a scene – that they rarely get that closure. That all too often one critical situation rolls into another, before they barely have time to process it. I gave each of the men a hug, a thank you in lieu of being able to pass that gratitude to those present that morning. The paramedics also said that they didn’t trade in false hope. They only attempted resuscitation if they thought there was a chance of life returning. To know that Xavier was that close, that the gap between him staying and leaving so very narrow startled me anew. I know how SIDS works. I know that there have been babies that have died by SIDS literally in their mother’s arms. That the mechanism that stops working in SIDS babies cannot be revived through resuscitation. Yet at the same time, it had me wondering yet again, what if I had woken just ten minutes earlier. For the most part I have given up on what ifs, they are not helpful on this journey. But with this new bit of information, they snuck back in again. 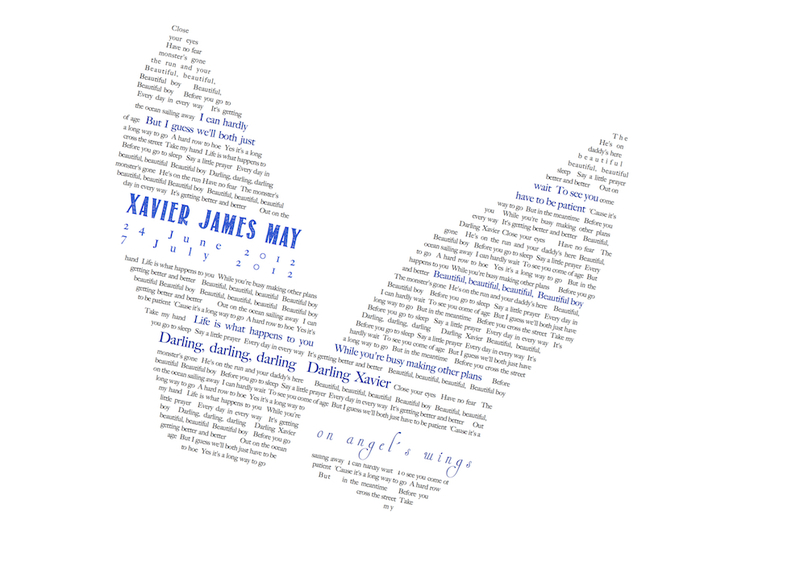 When I find myself in the darker places of grief, the places I thought I had left long ago, I set time aside and I do something creative for Xavier. I remind myself that he has his story, I have mine and we have our relationship. And I do something to nurture that relationship. I created a text butterfly for him, and I will share how I did that in separate post. Grief can take us by surprise, but as with all things within this journey, we can choose what we do when she does so. Love and Light. This is why I have always been forgiving of my Dad with his tendency to be over protective. I know he’s seem too much in his forty years of service and understandably worries after seeing bad things happening to good people far too many times. Very kind of you to recognise the heavy hearts our ambos, police, nurses and other services hold.